QUESTION: Is there a way to teach cycles that will enable others to see them more easily? ANSWER: Oh yes. Students who developed visual mental models of cyclical principles flourish, while students who tried to learn cycles by rote invariably struggled. The mental picture is critical. It is a roadmap to the future. 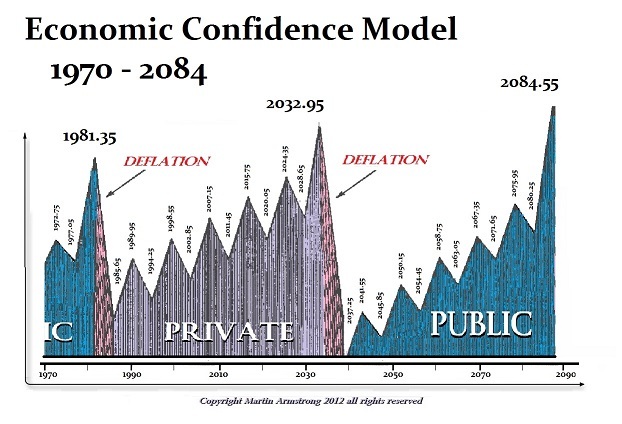 Just visualize the Economic Confidence Model and it will help to comprehend the business cycle and where you are at any given moment. For example, in 2007 when everyone is buying houses, you can keep this in mind and take a pause, encouraging yourself to wait until next year. The same is true for expanding your business. The first time I really used this model in that decision process was 1976. I signed a lease for space and I got them to give me a 10-year lease. I negotiated the elimination of a CPI clause. Everyone was talking about a depression. My accountant thought I was nuts. I told him this model was never wrong and I was going with it. The space I took at $10 a square foot was $45 by 1980. This model can provide tremendous guidance if you keep it visualized in your mind.